Mumps is a viral infection spread from one child to another via saliva (spit). The condition has been around for centuries, but after the invention and routine use of the mumps vaccine, cases are rarely reported. The main area affected by mumps are the parotid salivary glands. These glands are located behind the cheeks. After infection, the glands may swell leaving the child with cheeks that looked stuffed. Symptoms typically begin with a high grade fever around 103 degrees. 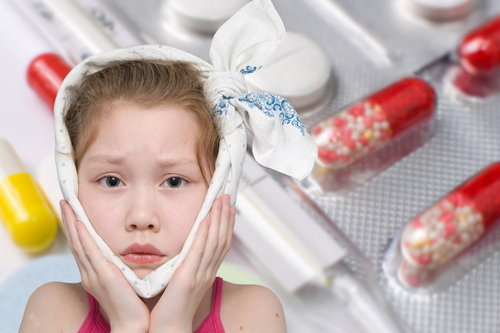 Your child may experience a headache and upset stomach or appetite loss. If the parotid glands are affected, one or both may start to swell. Due to the location of the parotid glands, the child may look like a hamster with food-stuffed cheeks. One or both glands may swell and, in some cases, other salivary glands may be affected. Any use of the mouth may increase the severity of symptoms and pain, including talking, eating or drinking. Sour or tart liquids, like orange juice, may also increase pain. Can the Mumps Lead to Other Conditions? In rare cases, mumps may lead to a swelling of the brain or meninges surrounding the spinal cord. These conditions are known as encephalitis and meningitis, respectively. Male children may suffer from orchitis, or a swelling of the testicles about a week after the parotid glands start to swell. Orchitis may affect one or both testicles. Females may experience abdominal pain if the ovaries are affected. The mumps are contagious. The virus is passed through saliva and mucus, which can enter the air when coughing or sneezing. It is important not to share cups or utensils with a person diagnosed with mumps. The virus can be passed to other children before symptoms arise. Preventing the mumps requires a vaccination (MMR), typically given as part of the childhood vaccination series. Two vaccinations are required before entering school and additional vaccinations may be suggested later in life. The body builds immunity to the mumps quickly, so one infection is all it takes for the body to be immune to further infection. Due to the fact that mumps is caused by a virus, antibiotics are not an option. Children can be treated with fever reducing medications. Swelling of the parotid glands may be controlled with warm and cold compresses. If there is pain, doctors may prescribe pain medications to promote rest and successful healing.